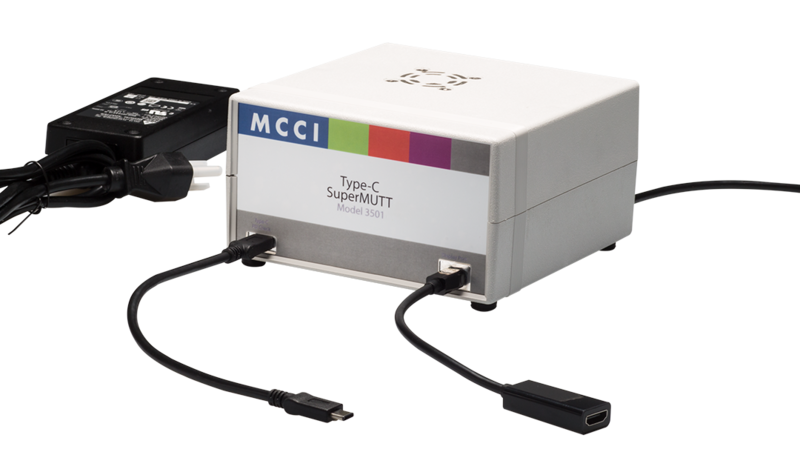 MCCI introduced our Model 3501 Type-C SuperMUTT today, the latest addition to our line of USB development tools! Back in the early days of USB 2.0, Microsoft needed a tool that would let them verify the operation of high-speed host controllers and of their USB host stack. So they invented a test tool, and named it the “Microsoft USB Test Tool”, or “MUTT“. This device has a Cypress FX2 controller chip and a lot of test firmware that let it emulate a variety of devices and thoroughly exercise all four transfer types on USB: bulk, interrupt, control and isochronous. It was a small device, that plugged into the USB port like a thumb drive. When USB 3.0 came out, Microsoft wanted a similar tool for testing SuperSpeed host ports. So the “SuperMUTT” was born. This device has a Cypress FX3 controller, which adds SuperSpeed support (now known as USB 3.1 gen 1, or 5 gigabit USB). Again, they added a lot of firmware and host software, but the concept was the same — a small devic ethat plugs into the USB port like a thumb drive. I suspect you can guess where this is going. The Type-C SuperMUTT is simply the SuperMUTT, enhanced for Type-C support. But why is it so much bigger? Support for connecting to an external charger, again for testing. In order to be able to accurately emulate all the variants of the PD specification, the PD interface is implemented with a Lattice iCE 40 UltraPlus FPGA. This gives the ability to emulate the different design decisions of different manufacturers, as well as the ability to emulate and inject various kinds of faults. With all of this functionality, and all of the electrical power that can be handled, we needed to have a fan. And we needed to have a robust enclosure. Hence the model 3501 as you see it above. As you might guess, the 3501 was developed in conjunction with Microsoft; they’ll be supplying the Windows test software and embedded firmware for the product. We’ll be receiving the second production lot in late September, and we’re taking orders now via our online store. You might have noticed that some of our literature calls the Model 3101-family of USB Connection Exercisers the “MUTT ConnEx-C”. This is because it’s really a part of the Microsoft USB Test Tool family (and you can see it here on the MUTT page at Microsoft). Interested in learning more about the details? Post a comment here with your questions, or tweet me at @TmmMCCI, and I’ll do my best to answer.